You may have studied ancient Roman history in school, but many of you may not be aware of the critical role played by the fast and effective Roman Chariots in conquering the UK and a large part of continental Europe. These chariots were not only used in battle, they also provided entertainment while being used in races. A reputed gaming software developer, WMS has built on this theme of Roman history and come up with an exciting new game. It has 4 sets of reels, with each of them having 5 reels. In addition, the reels can be supercharged. So go ahead and play free Roman Chariots casino slot machine if you simply want to have fun without making any deposit. You can also play for real money. Spin: A new round is started. Stop: The reels can be stopped when you want. Lines: Displays the number of active lines. Feature Bet: Displays the size of wagering bonus. Bet Multiplier: Select the size of your wager. Total Bet: Displays the total stake. Win: The payout for each spin. Paytable: Contains the rules and displays the pay table. Playing cards like 10, J, Q, K, and Ace are of low value. So the payout may not be very high but at least you will end up winning something. But you will get a good number of chances from the main icons, the special symbols like the Wild, Bonus and the spin symbols. A breastplate which is a body armor made of gold. A horse which gives the highest payout in this slot machine. If you see 5 horses in a row, your prize would be 400 coins. This would be more than twice the winning from any other symbol. A charioteer who looks like a Roman Emperor. This offers the second highest payout of 150 coins. A pair of crossed swords. With the exception of the horse, a minimum of 3 symbols of each kind on an active pay line in a left to right direction is needed to make a winning on this slot machine. 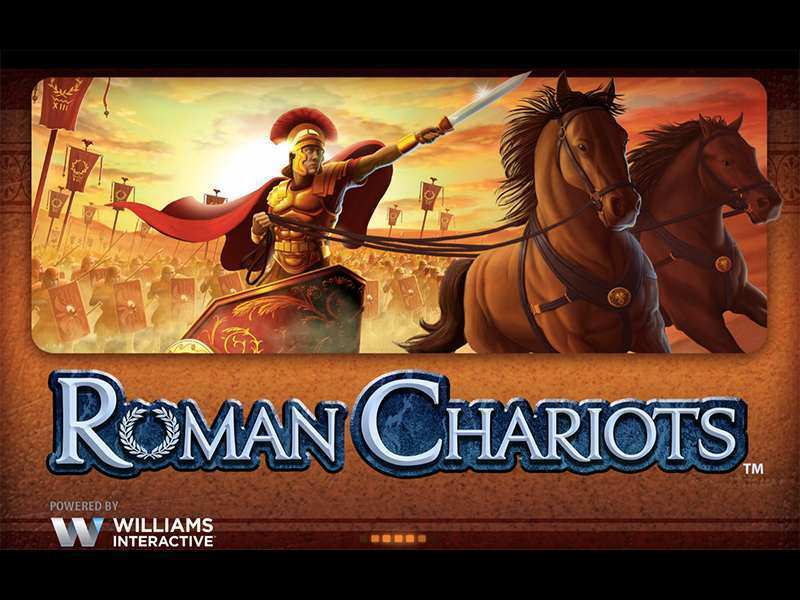 A Roman soldier on the back of a chariot is the Wild symbol in the Roman Chariots slots game. This is stacked on the 3 middle reels of the main screen, i.e. second, third and fourth reels. With the exception of bonus and spin symbols, all the others turn wild during free spins. The chariot wheel is the bonus symbol which is, in fact, the Scatter. It can be seen only on the first and fifth reels. If you see it on both the reels, the free spins round is activated. The fifth reel is of great value as it has a Spin symbol of green color and a Reset symbol of red color. Eight free spins can be activated and the cash prize would be twice the total wager. One of the best things about gambling on this slot machine would be the Super Charged Reels. All the symbols are lucky. So you are sure to win a prize when this feature comes into play. Above the main reels, you can see 3 sets of reels labeled A, B, and C. You can see a full wild on the second set of Reel A, the 3rd set of Reel B, and the 4th one of Reel C. Full wilds in the main game will make the reel sets charged. The green spin symbol brings you extra prizes. One good thing about this slot machine is that no download is required. You can play it in the flash mode in your browser. The Super Charged Reels, Free Spin Bonus rounds, and multipliers make this game very popular with lovers of online gambling. So get on your chariot and ride away with your riches. 0 responses to "Roman Chariots Slot"